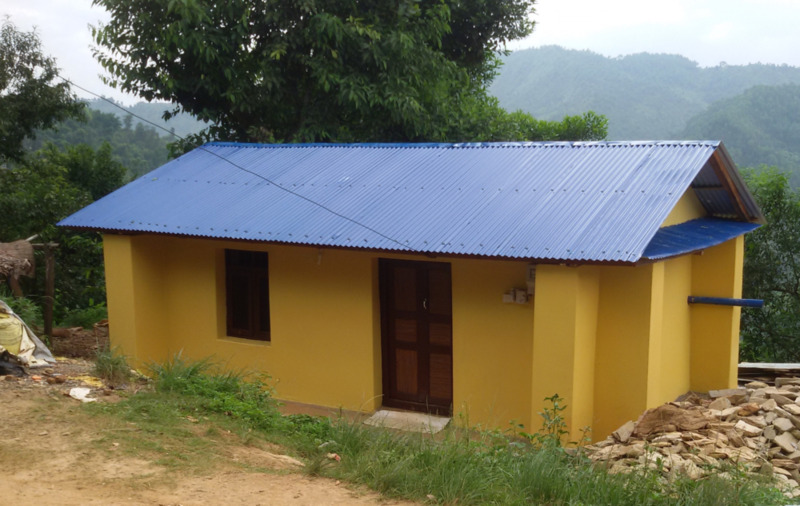 In July we completed an Earthbag home for Kamala, a widow with two daughters, Nabina and Rabina. Kamala and her daughters live in Tandrang, a small village in Ghorka. During the earthquake, their house was completely destroyed. Village elders chose Kamala’s family, among many in need, to receive the first house. The house we have built looks just like a typical village house from the outside, but is made of Earthbags instead of the traditional mud and stone. With proper maintenance of the external plaster, the house can last for centuries. In addition to providing a home for Kamala and her daughters to live in, the house will serve as a Model House, so villagers can learn the benefits of Earthbag technology, building their own Earthbag houses. Since completion, the villagers have expressed a deep gratitude and appreciation for Good Earth Nepal efforts.